Ever get an email like that after posting your own music? I get them all of the time. When I first saw this, I was all confused… I knew this was my original work! How can someone else have a copyright claim on my music?! Important note for YouTube users: If you log into your YouTube account and see a copyright notice next to your videos, don’t worry! CD Baby will collect money for the usage of your music in videos (this includes videos you upload). 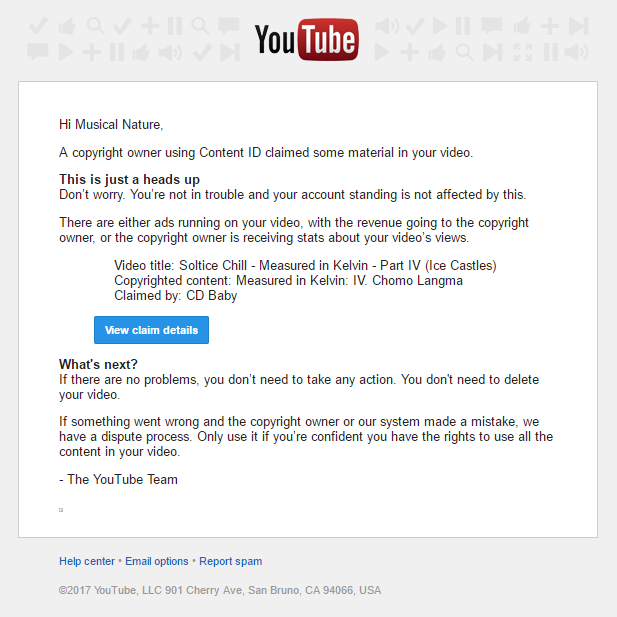 This notice means the content ID system identified your song and it’s now setup to generate revenue for that video. You don’t need to take action. CD Baby is not claiming ownership of your song. See? all should be just fine. This confused me when I first saw it… so hopefully this post helps another artist along the way.